iOS 9 has been release for about 24 hours and some people has updated their iPhone/iPad/iPod touch to experience new features of iOS 9. 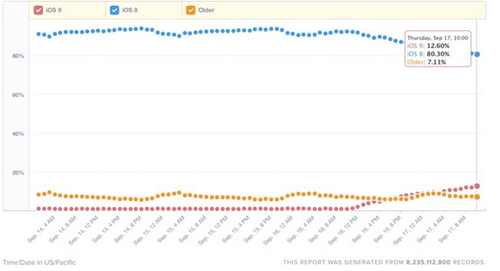 According to multiple analytics companies that are tracking iOS 9 adoption rates, iOS users are installing Apple’s latest operating system at roughly the same pace iOS 8 was installed last year, which means, it did not surpass iOS 8 in adoption rate in the first day. From MacRumors, Mixpanel’s live iOS 9 tracking site suggests iOS 9 is now installed on approximately 12.60 percent of devices, which is in line with iOS 8 adoption rates in 2014. Two years ago, iOS 7 saw much quicker adoption rates than we’re seeing with iOS 9, but that is not surprising as iOS 7 marked the last major design update to the operating system. iOS 8 and iOS 9 brought many new features, but few visual changes. What is surprising is that iOS 9 adoption is not outpacing iOS 8 adoption because iOS 9 has a much smaller installation size. While iOS 8 required 4.58 GB to install, iOS 9 only requires 1.3 GB, making it much more accessible to users who have little space open on their devices. 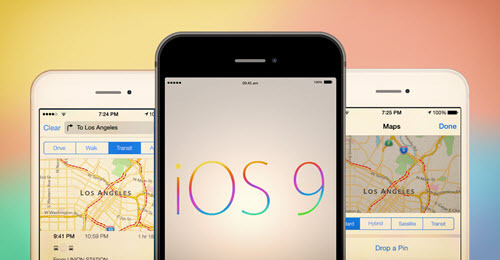 Plus, iOS 9 has more new features and bug fixes for iOS 8. Perhaps, some people just wait for the testers to reflect that iOS 9 is stable to use. This entry was posted in iOS 8, iOS 9 and tagged ios 9 features, ios 9 installation by IosdroneD. Bookmark the permalink.